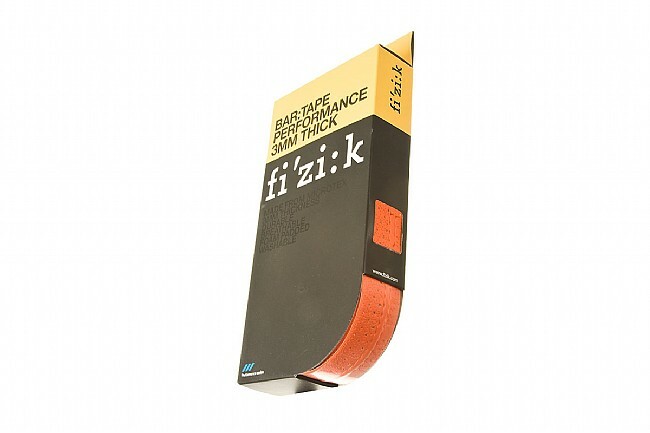 Match your Fizik saddle with this high quality Microtex bar tape. This new Performance tape is 3mm thick for slightly more padding than the original Microtex design. Fizik still produces a thinner, 2mm version as well (sold separately). 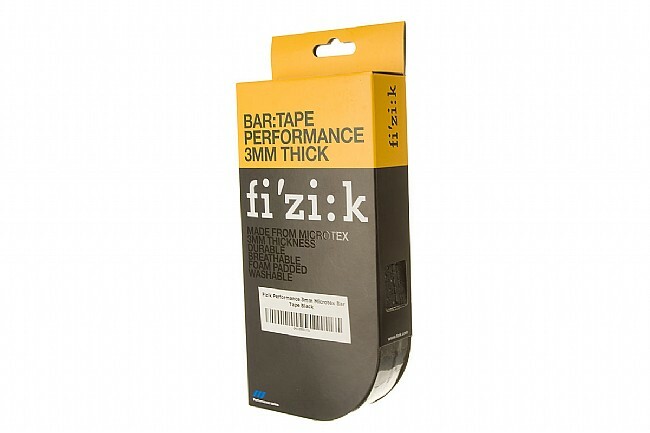 Microtex Performance 3mm Bar Tape includes 2 rolls of tape, bar end plugs and Fizik logo black finishing tape. THICK BAR TAPE IS A MUST FOR LONG RIDES OR ANY DAILY RIDING FOR THAT MATTER. I'VE USED A LOT OF BAR TAPE OVER THE YEARS AND THIS STUFF SEEMS TO BE REALLY DURABLE AND EASY TO CLEAN. ALL BAR TAPE FADES BUT I FEEL I GET MORE BRIGHT COLOR TIME OUT OF THE FIZIK TAPE THAN OTHER BRANDS. This tape looks good and is easy to apply. It is thicker, which I find more comfortable. I haven't needed to clean it yet, so don't know how colorfast it is or how well it will clean up. So far so good. First time applying bar tape. Left side took two attempts with a little re-wrapping on the second. Right side took one with a little re-wrapping. No tearing even when fully stretched for application. Feels great while riding, I would rate it a medium feel thickness at about 12 overlap (I used no gel or double wrapping underneath), noticeably thicker than the old crumbling stock tape on my 10 year old used bike. Durability unknown, only used it for a few rides thus far. Like the metallic blue color. Avid cyclist...I put new bar tape on all my bikes after a season or two. Never purchased Fizik tape before but saw a sale and purchased 2. Out of the box the tape looks high quality. Install...oh man, first there are about 5 inches of non logo ends on both ends of tape, no idea but I cut off and left about 1 inch on each end. Installing was strait forward, the ridge in the tape ensured even overlapping but when I got close to the curves around the brake hoods that's where I had trouble. Tape is very very stiff, I had to rewrap sever times to ensure I would not get wrinkles with the tape. After several attempts I still had one small wrinkle on each side of the tape..overall the tape looks, feels, and does its job..padding is quite good. I have installed this bar tape in my bike, and it's been awesome the past 3 months. When I replaced the bar tape, I was a little skeptical about the feel and installation. I can confirm, that this bar tape isn't hard at all to install. For a novice to install, it has a bit of give to it, allowing you to mess up a few times until you get it right. As for performance, this tape does take some breaking in after it is installed. For me, I took these on a few rides and they were grippy, but still a little stiff. But in about a week, they eventually gave loose, and you can feel it squish a bit and allow you to grip the bars well, as well as providing a reduction in vibration on some of the rougher roads. This tape offers a good comfortable feel and grip. I purchased this to replace a Fizik tape that was 10 years old and starting to show wear. The application is standard and simple. The finishing tape seems a little weak in comparison to the bar tape. Too short, Too stiff. Not flexible. Padding is hard. Great Tape! Thick and comfy! I bought this because it was half the price of lizard skins dsp which is on my road bike. This tape was going on my Tri bike and decided to give it a shot. Great thickness and wraps really well. Not too grippy like the dsp, but has a nice smooth feel. I wear gloves and the tape goes well with gloves. Seems durable, have a Fizik saddle and it has been holding up well, I hope the same for the tape. Very affordable and would definitely buy again. Bike Tires Direct is the best! It's very nice bar tap. Has just the right amount of padding and stickiness. Relatively cheap. Mine started to show wear (paint peeling off) after 8k miles. I love the feel of this tape. Soft touch black feels furry. I put this as a double wrap on my CX bike. Very easy to install. Provides great cushion and is grippy, which is good for wet and sloppy conditions. The thickness of the tape makes it hard to stuff the end caps. There is a lot of self advertising on this tape that you can mostly cover when wrapping a specific direction. I'm not sure why one edge needs to be white. The tape works well, it just takes a bit of effort to apply it properly and achieve a nice clean look. Tried tons of different tapes, none as good as the 1.8mm Pinarello branded tape that is now unobtanium, this is good stuff though, would use again. Use this on my 90's Reparto Corse Bianchi track bike. The whole ride is a looker, and this tape doesn't detract from that. In fact, it looks GREAT. Plus the tape is light and comfy. What more could you ask for? As with everything in cycling, everyone is different when it comes to components on their bikes. 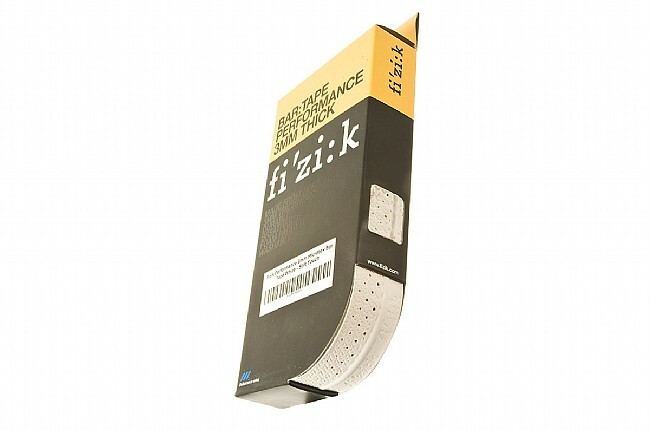 I have not used Fizik bar tape for several years. Mainly (if you can believe this) it is so long lasting that I pull it off as I get tired of looking at the stuff. Now onto my review- This is thick tape, not too flexible and I find it somewhat difficult to apply, especially around the bends. You have to wrap tight and slow and make sure not leave any gaps. There is a ridge on this tape that allows you to overlap perfectly, although when going around the bends you can't do that. When getting to the tops you might have to try a few wraps or it might not come out perfectly even to the distance to the stem. It's thick tape, like I said, but it wraps thin. Has a great feel to it. Perfect amount of cushioning for me (before I was using gel tape). It has a light adhesive backing, so if you mess up, you can pull it off and try again. It looks great. I have 44 bars and had to cut off a lot of tape (I'm thinking 8 inches or so). There are blank spots) on both ends of the tape that kind of baffles me. I cut about half of those off on both ends. I used black electrical tape and used the Fizik logo finishing tape as an after thought. And the bar end plugs fit my bars without a couple of wraps of electrical tape (horray!). I think this will be my go to tape. This tape looks great and performs flawlessly on my cyclocross bike whether riding it on an urban assault or trashing mercilessly off road. I love it! But the orange- it rules! I'm on my bike 24/7 no matter the weather conditions. I've been highly satisfied with this tape due to its excellent grip during heavy rain conditions as well as it's durability. It stands against the Texas heat and still retains its semi gloss finish. It's sleek design is eye catching and it feels excellent over most terrain.